Eco-Bend is designed for the purpose of bending for steel rules with high quality requirement. • Suitable for any complicated bend. • Unique adjustment system guarantees handle movement is the same for any bend required. • Large mechanical advantage enable thick rules to be bend with minimum effort. • Repetition bends can be produced without fear of inconsistency. • Eco-Bend is designed for the sole purpose of bending of steel rules used for die-cutting and creasing of paper, cardboard and corrugated board. • Eco-Bend is a manual device, and does not carry magnetic or electric requirements. • Eco-Bend is to be installed on a suitable working table and operated in a die-room. • Suitable for bending different types of cutting knives set with complex shapes. • The machine is made of firm and solid alloyed steel. 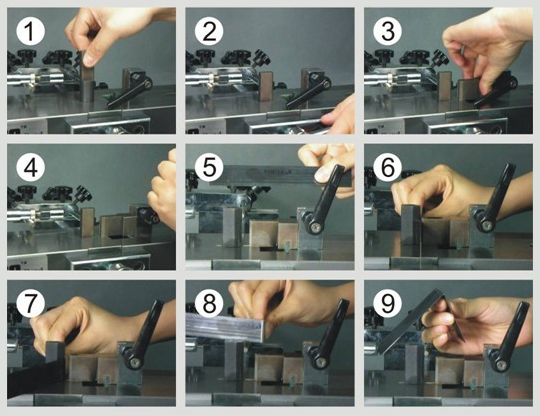 • With the unique adjuster, easy to operate when bending each type of cutting knives set. 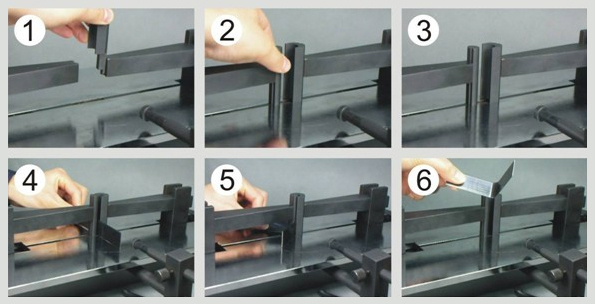 • Through adjusting the screw position, easily achieve the ultimate bending position. 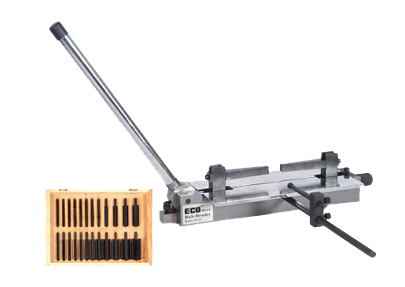 • The ingenious design makes the bending tools achieve consistency completely. 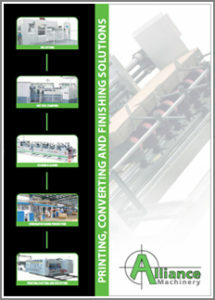 • Eco-Bend is designed for the purpose of bending for steel rules with high quality requirement. • Simple adjustable gauge with some screws movement for final positioning. • Eco-Bend is designed for the sole purpose of bending of steel rules used for the die-cutting and creasing of paper, cardboard and corrugated board. • Suitable for bending different types of cutting rules with complex shapes. • With the unique adjuster, easy to operate when bending each type of cutting rules.